For years, homes have been constructed as tall square, or rectangular, buildings that are made of wood, bricks, siding, shingles, and other materials. While many of those homes have withstood some of the elements that nature has brought their way, they are not as resistant as monolithic dome houses. The fact that monolithic dome homes are strong enough to survive earthquakes, hurricanes, tornados, and more is reason enough for many people to give them a second thought when they go to build a new home. These newer homes look quite different than what everyone is used to seeing as they pull up to a person’s house, and the materials that are used during the construction process are very different as well. 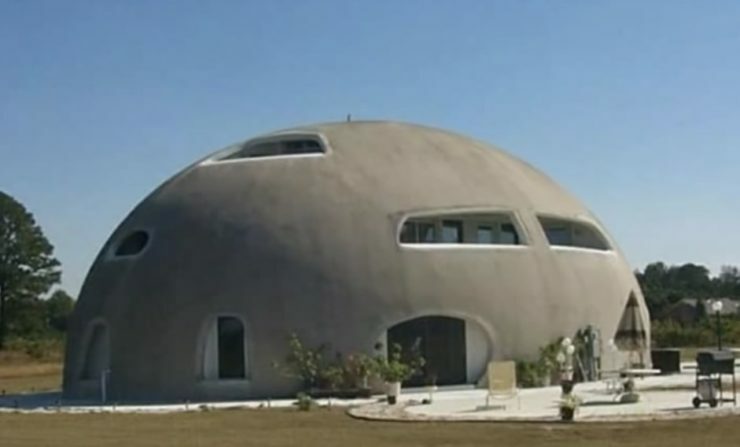 A monolithic dome house uses inflatable Airform, which is strong and durable, plus steel reinforced concrete and polyurethane foam insulation. The construction of this type of home begins with a foundation that is a concrete ring. The foundation is then reinforced with steel rebar, which vertical steel bars that are placed vertically in the ring and will attach to the steel that is going to reinforce the actual dome house. There are times when the flooring of the monolithic dome house is completed with the ring, but most often it will be poured later when the entire house is finished. Once the ring is ready, the Airform is placed onto it. The Airform is manufactured into the shape and size that is needed off-site, so that the only thing that needs to be done is the inflation process. That step uses blower fans and those fans will stay on through the entire construction process. The polyurethane foam is applied to the inside of the Airform until it is approximately three inches thick and it will eventually act as the base where the steel rebar is attached. The reinforcing is completed by utilizing horizontal and vertical steel rebar and the size that is used will be dependent on how small or large the monolithic dome house is. As soon as all the reinforcing bars are in place, it is time to spray a concrete mixture inside the house. The amount of concrete will end up measuring approximately three inches too, and once it dries, the blower fans can be turned off and the monolithic dome house will be ready for occupancy. Monolithic dome houses may seem to be a little unusual, but once a person walks inside of one, they will see how amazing they really are. In fact, other than the shape and the durability, these houses are just like any of the others that have been constructed around the world.